Scuba diving in Bangkok, dive training courses and day diving trips in Pattaya to wrecks and coral islands with Mermaids Dive Center - PADI 5 star CDC. All-inclusive dive trips prices start from just 3,000 baht! If you never dive before, but want to try, please sign for our "Discover Scuba Diving!" program. We have confined water training in pool in Bangkok and you will have a chance to complete course in Pattaya in the ocean. Pattaya Dive Sites are just a short trip away from Bangkok. 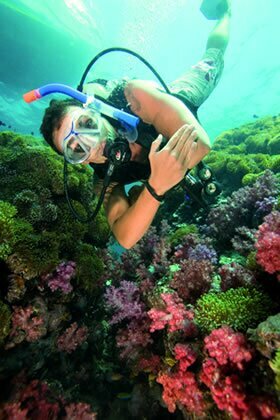 The main scuba diving areas around Pattaya are located in what we call the "Far Islands". These are the second ring of islands 40 minutes on a dive boat from Pattaya. The islands are controlled by the Thai Navy, and no permanent structures are built there (boat traffic also at a minimum). These islands include Koh Rin, Koh ManWichai, Koh Keung Badaan, Koh Hu Chang and Kho Phi. Altogether, we have up to 20 different dive sites with visibility ranging from 5 - 15 meters. There are many different types of soft and hard corals, and large schools of Jacks, Barracuda and Tuna. Blue spotted Stingrays, Turtles, Porcupine Puffer fish and Moray Eels can be spotted on virtually every dive. The highlight of Pattaya and Samae San diving is the two, superb shipwrecks. The HTMS Khram is a new wreck that was recently sunk by the Thai Navy for divers! The Hardeep is a 60 meter long cargo ship sunk in 28 meters during the World War II era. This ship is reasonably intact, and can be navigated from bow to stern entirely on the inside, by our dive leaders. Day Trips include: transfer to the boat, hot meals and water on the boat, full set of scuba equipment, tanks, weights, hotel pickup and drop off. Not included: transfer from Bangkok to Pattaya (1,800 baht/one way), nitrox fill, dive computers, compass, torch, etc. Own equipment: we will give you additional 20% off, if you bring your own equipment from Bangkok.